And I tell you, you are Peter [Greek, Petros—a large piece of rock], and on this rock [Greek, petra—a huge rock like Gibraltar] I will build My church, and the gates of Hades (the powers of the [infernal region) shall not overpower it [or be strong to its detriment or hold out against it]. I have deliberately used the Amplified Bible's version of this Scripture today. I have found that I often prefer this version because the Amplified Bible (AMP) attempts to take both word meaning and context into account to accurately translate the original text from one language into another. We have lost so much in the translations from Hebrew to Greek to Latin to English; sometimes the chosen English word just doesn't do the Scripture justice. As one of my favorite websites, Bible Gateway, explains it ... "The AMP is based on the American Standard Version of 1901, Rudolph Kittel’s Biblia Hebraica, the Greek text of Westcott and Hort, and the 23rd edition of the Nestle Greek New Testament as well as the best Hebrew and Greek lexicons available at the time. Cognate languages, the Dead Sea Scrolls, and other Greek works were also consulted. The Septuagint and other versions were compared for interpretation of textual differences. In completing the Amplified Bible, translators made a determined effort to keep, as far as possible, the familiar wording of the earlier versions, and especially the feeling of the ancient Book." I think you can see that this Bible version has gone to exhaustive lengths to preserve the original meaning of Scripture. And we certainly need to know the context and the understanding of the First Century when trying to comprehend what our Lord is telling us here. First of all, we need to understand where Jesus and His disciples are standing when he declares this oft-repeated verse to Peter. 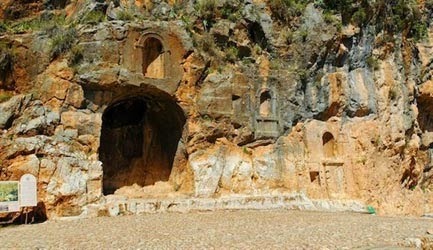 The chapter of Matthew 16 takes place in Caesarea Philippi, which was an ancient Roman city located at the southwestern base of Mount Hermon, adjacent to a spring, grotto, and related shrines dedicated to the head of the Greek gods, Zeus, and his son, Pan. In the Old Testament, this region was known as Bashan. You might recognize that word in the context of "Og of Bashan", a giant king mentioned in Joshua, Chapter 12, who was defeated by both Moses and Joshua. Og was a descendant of the Nephilim, the offspring of the union between Fallen Angels and human women; which is noted in the controversial (yet true) passage of Genesis 6:1-4. Even more amazing is that Mount Hermon was the exact location where the Fallen Angels descended to corrupt humankind. This area would have made Peter and his fellow disciples very uneasy. They knew they were standing on ground that the Nephilim had inhabited, and in Jewish theology, the spirits of these dead warrior-kings were demons. They believed that this area, with its connection to Fallen Angels and temples dedicated to Zeus and Baal worship, was the entryway to the underworld -- the gates of Sheol, which simply means “the place of the dead” or “the place of departed souls/spirits.” (The New Testament Greek equivalent is Hades, or in English, Hell). In this case, with its history involving Fallen Angels, it was an area of evil departed spirits, or demons. Therefore, Peter clearly understood what Jesus was saying -- that when He referred to "the rock" on which He would build His Church, He did not mean either Peter or Himself. Peter and the other Disciples knew Jesus was talking about the very rock on which they were standing -- the foot of Mount Hermon, the demonic headquarters of the Old Testament and the Greek world. Perhaps you have believed the comparatively recent explanation that "the gates of hell shall not prevail against it" describes the Church defending itself against an assault by Evil. But the word "against" does not appear in the original Greek translation. Try getting a sense of the phrase without that word ... "the gates of hell will not withstand it." See the difference? What Jesus is really saying is that the Church is the aggressor! Our Lord was declaring war against Evil and Death. Jesus declared His plan to start His Church on that very spot -- on the top of the gates of hell -- and He would crush both Evil and Death, and bury them! He was declaring Victory over the demonic spirits and their rulers! By proclaiming Peter as like a large rock, He was telling him that he need not be afraid of the power of Sheol; the power of Jesus's Church was a huge rock and would smash the rocks upon which the gates of hell rested. Knowing the area in which they stood, you can imagine what a powerful affirmation that was for Peter! As you can see the true understanding of this Scripture is a bit more dramatic than we have assumed in the past. It is not about the Church defending itself against an onslaught of evil, but about Jesus intending His Church to take the fight to the Enemy. This understanding is so much more profound and insightful! I think you will agree with me that anytime we can grow our knowledge of Scripture, we are blessed and enlightened. Excellent examination of the Word today. Thank you. This is on my Daily News Menu, as your posts usually are, and has been forwarded on to Steve for his Anakypto Forum. Pastor Roger Anghis has a new post at http://newswithviews.com Is the Bible Accurate? I emailed him and asked him which Bible he uses. He suggested the J P Greene Interlinear Bible, available online. If you don't believe that the "Watchers", the fallen angels did exactly what the Bible says in Genesis 6:1-4, as Belle states, and that they descended from Mount Hermon, go to flashearth.com and go to Damascus, Syria, move west toward Mount Hermon (may have to zoom a little to make the symbol of Mt. Hermon appear). The symbol is at the peak. Just left of the Mount Hermon symbol, zoom as much as you can and see what building is sitting at the peak of Mount Hermon. Yes, it is significant, and Belle is telling you the truth. And, it will happen again.